Home / Smart Views, Smart Views / How do I edit or remove an existing Smart View? How do I edit or remove an existing Smart View? 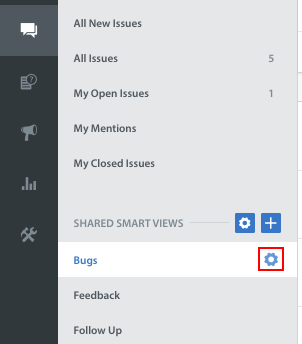 To edit or remove an existing Smart View, navigate to the Issues page, click the title of the Smart View you wish to edit or remove as listed under the ‘My Smart Views’ header, then click the gear icon that appears to the right of the title. The ‘Update Smart View’ form will appear where you can edit the individual settings for the Smart View. Click the ‘Save’ button at the bottom to save any changes made. To remove the Smart View entirely, click the red ‘Delete’ button located at the bottom of the form. A prompt will appear requesting for you to confirm your intention to delete this Smart View. Click the ‘Delete’ button to complete this action. The functionality is the same to edit or remove Shared Smart Views. Please note: you cannot edit a Smart View when it is in a folder. Please move the Smart View outside of the folder to edit it. To learn how to reorder your Smart Views, see How do I reorder my Smart Views? 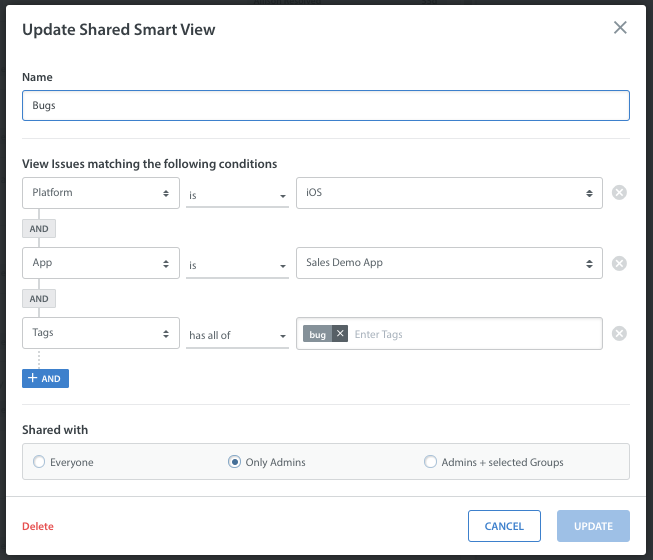 What are Smart Views, & how do I use them? How do I create Smart Views? How do I organize Smart Views into folders? How do I reorder my Smart Views?